Bing, why you so silly? : Is There A Problem Here? : Bing, why you so silly? Bing, why you so silly? This morning, Bing began returning some odd search results. So, I then tried searching for some things for which I had some expectations for results. How about HP Quality Center? 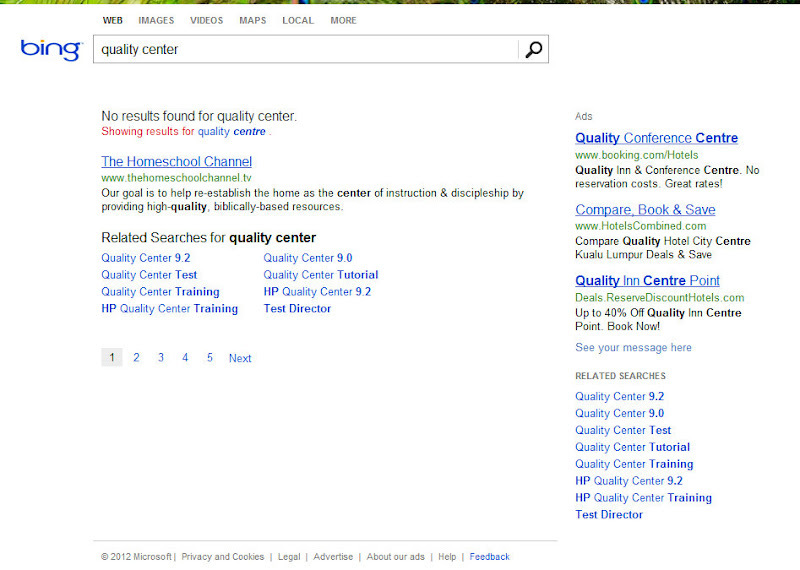 Bing certainly has something about Quality Center. 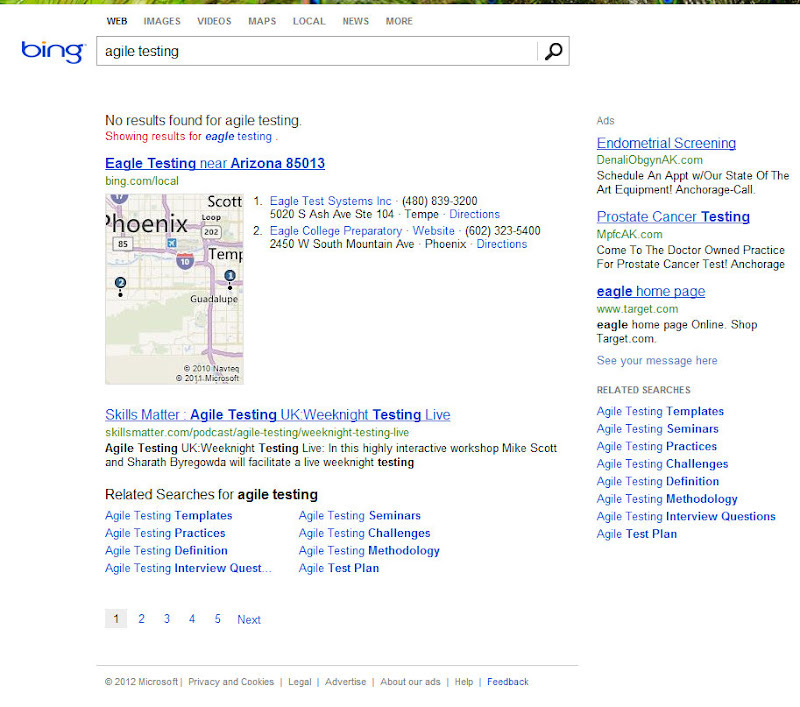 In fact, it was my looking for licensing information that started my questioning of Bing's results. Not what I expected. So, I continued my testing with "testing". 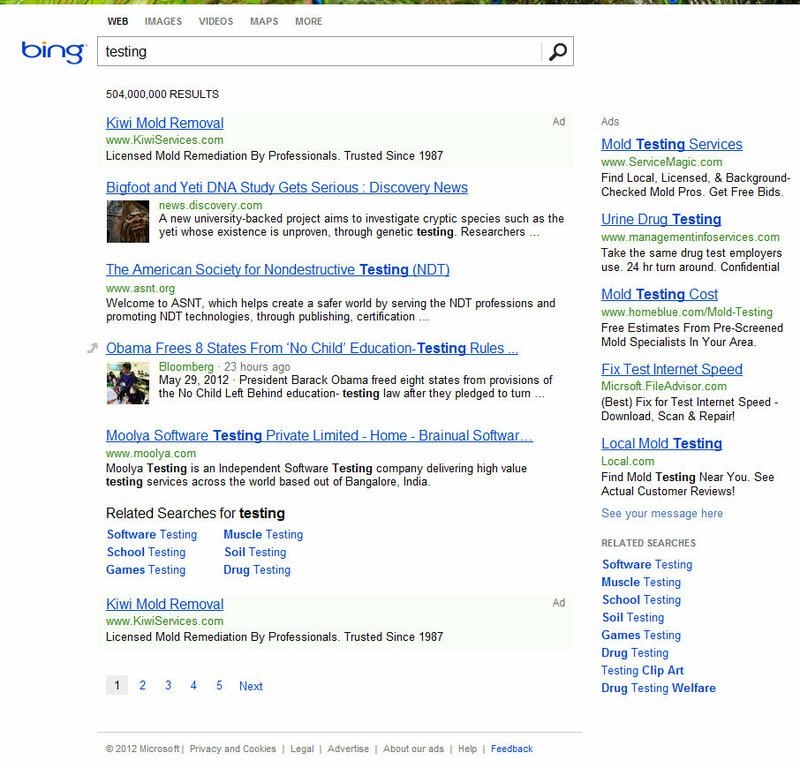 Certainly Bing can direct me to some web pages about testing. American Society for Nondestructive Testing. While I'm sure my friends at Moolya would be pleased to be on the first page of search results for "testing", something doesn't seem right with these results. Perhaps I need to be more specific about what kind of testing I seek. After all, testing is a very broad topic. I try to narrow it down with "agile testing". Hmm... Perhaps the folks at Microsoft aren't familiar with agile testing. And, I'm certainly not interested in going to Alaska for some agile uterus or prostate testing. Now, what's something else for which I've previously seen results? Oh, yeah; the Lewis and Clark expedition. Perhaps Bing can help me explore the web for information about these explorers. Hmm... Not what I expected. And, I don't think I can find them on MyLife. Given that Bing doesn't seem to know much about testing or exploration, I wonder if they know anything about their founders. 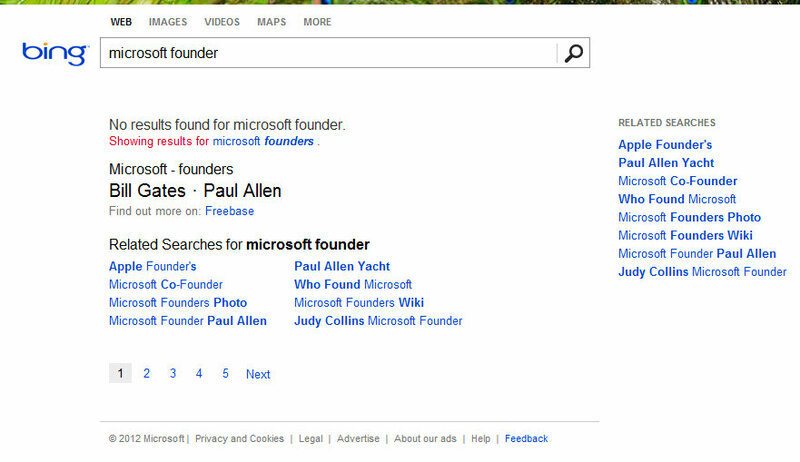 So, I search for "microsoft founder". 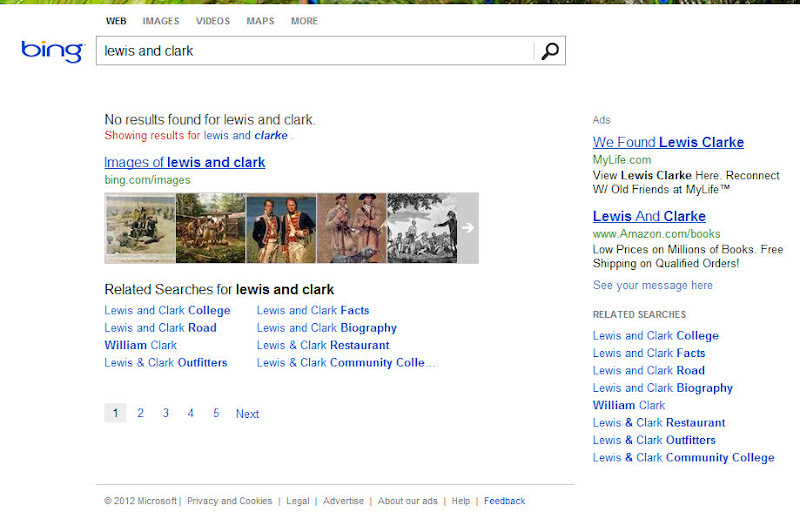 Bing says "No results found for microsoft founder." However, in spite of having no results, it does see fit to tell me that Bill Gates and Paul Allen are the founders of Microsoft. I expected a few more links when asking Bing about its founders. 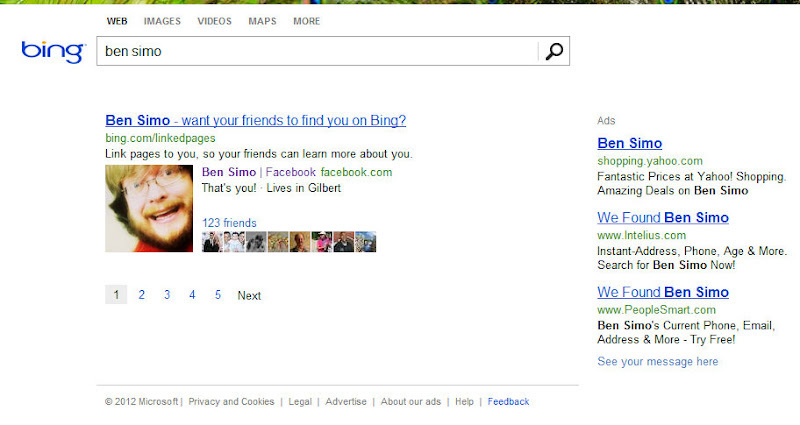 So, if Bing has so little information about its founders, I wonder what it knows about me. It seems to have found my Facebook profile; and apparently, I am on sale at Yahoo! Shopping: "Amazing Deals on Ben Simo". So, what might Bing know about? Let's try something a bit less intellectual. Sorry, "No results found for fart." Perhaps, I should try some related searches. Bing suggests "Loud Farts", or "Listen to Farts", or "Do Lizards Fart". I always wanted to know if lizards fart, but I think I'll first click the link to see Regis Philbin fart. That's the high quality web content I seek when I use Bing. These results are making me think I must be the victim of a cruel joke. So, while I'm thinking of jokes and farts, I put them together. Again, Bing disappoints. 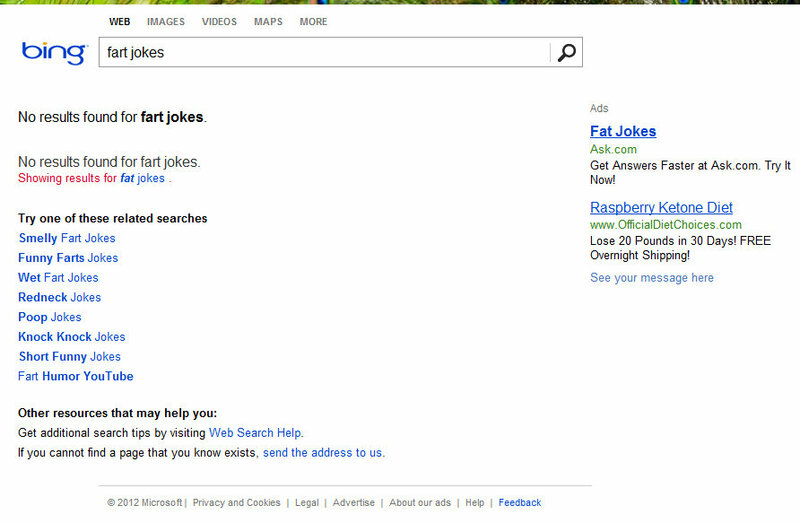 It has no results for fart jokes. 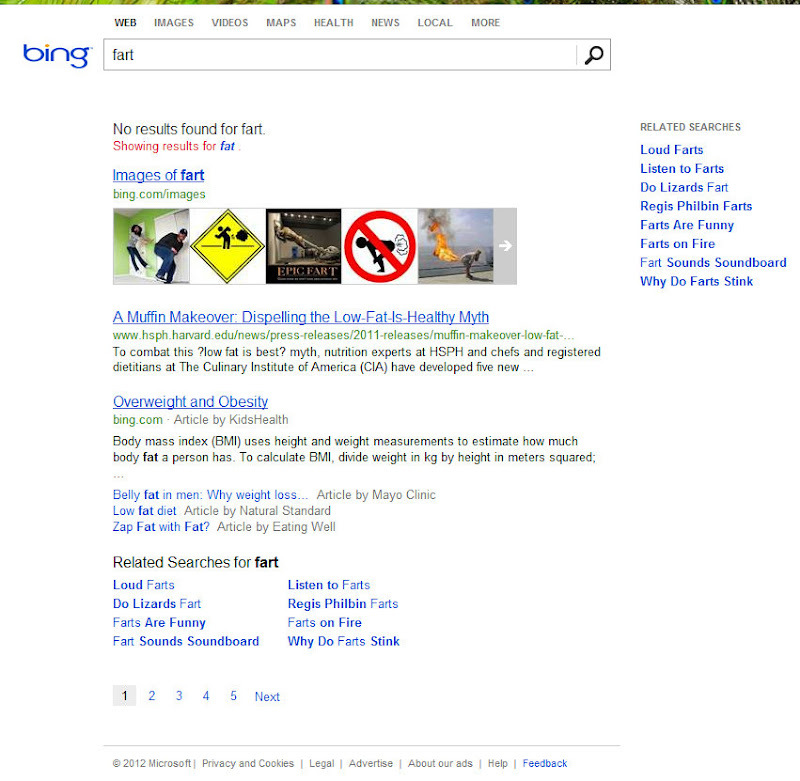 Instead, Bing trys to show me fat jokes. It doesn't even have any of those; unless the Raspberry Ketone Diet is a fat joke.